This fall I went to a press preview that showcased four designers: Tura Sugden, Kimberlin Brown, Sophie Hughes and Diana Mitchell. I knew the first three well, but had not met Diana. I discovered that her jewelry is delicate and stackable but also unique. It's all yellow gold and diamonds, which is my favorite combination. The pieces feel very special. Get to know more about Diana and her collection below! I have always been a hands-on and design oriented person, but I took my first metalsmithing class about seven years ago after graduating from college, where I studied architecture and architectural history. I was hooked from the moment I soldered my first piece. I felt like I was making personal tiny pieces of architecture. I quickly decided I wanted to pursue a career in jewelry and I moved to NYC to attend the jewelry design program at FIT. I then worked as a jeweler for a few years for different designers in New York before starting my own line in 2013. Last year I moved my studio from Tribeca to Brooklyn, where I now design and make each piece. My design process is not strict or set in stone. But I do usually sketch a lot before starting to work on a piece at the bench. I find that drawing helps me develop the design and also work out the technical details. Then the design often changes somewhat as I start to carve wax or work in metal and I see the piece come to life. I think my background in architectural design definitely influences my jewelry. I focus heavily on the form and function of each piece. When designing, I think a lot about how the piece relates to the body and to other pieces in my collection. I am also inspired by the materials themselves –18k gold is such a beautiful metal to work in! Favorite design: My favorite piece from my own collection is always changing - it seems to be whatever is new! So right now, that would have to be my new half moon rings. Personal collection: My favorite piece is a necklace my grandmother passed down to me. It is a solid gold woven chain lariat with carved lion head ends that have tiny ruby eyes. She got it while traveling in Greece with my grandfather. Daily Jewels: I have one necklace that I have worn every day for the past 4 years, my gold arrow necklace. It is the piece that my first collection was built on. 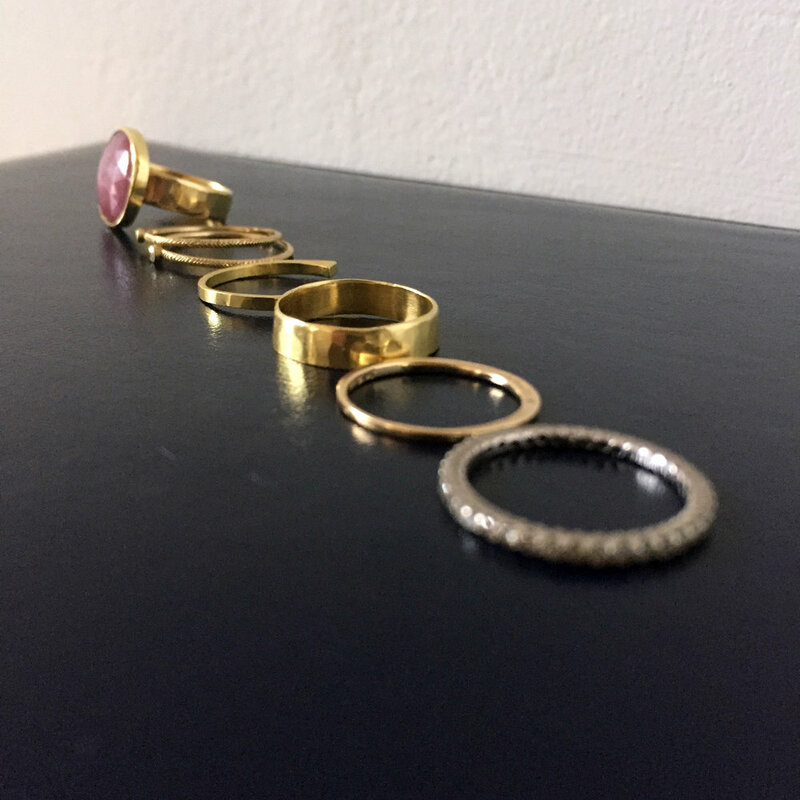 Along with a rotating collection of gold rings, I always wear my wedding band and a Nora Kogan “mama” ring that my husband gave me for my first Mother’s day. I also always wear some combination of gold studs. Favorite designers: There are so many amazing jewelry designers and craftsmen I admire. But to name a few past and contemporary designers whose pieces have literally taken my breath away – Rene Lalique, JAR, Judy Geib, Marie-Helene de Taillac, Lucifer Vir Honestus, Anthony Lent and Polly Wales. Other than jewelry: I have a 1 year old, so when I’m not making jewelry, I love to explore the city or hang out at the park with him. When we can get away, I love trying new restaurants and seeing live music with my husband and friends. Currently listening to: Now that Thanksgiving is over, I’ve been listening to Christmas music non-stop! But when it’s not Christmas time, I always love the Gin Blossom Spotify station, that is if I’m not listening to a podcast. My favorite designs by Diana are below, but check out her website to see more!